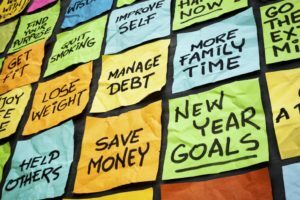 The New Year is a really good time to overhaul your life for the better and this should include your Financial Goals. A great way to start is to make solid financial resolutions to help you get closer to your goals. Here are a few areas you might consider in getting closer to your financial goals. Cost of debt varies significantly. Make a list of your liabilities and organize them by the annual interest rate. Those with the highest rate of interest should be paid off immediately. It’s important to shop around if you have credit card debt charged at a high rate of interest. I would suggest to either ask your current provider to provide a better interest rate, or get a 6-month 0% interest facility with a different credit card company. An alternative method could be to take out a loan with your local credit union or bank. I recently accumulated credit card debt for €2,000 and was charged 20%, circa €400 per annum in interest. I restructured it with the credit union and I’m only being charged 10%, saving €200 a year. Set up a regular but affordable monthly savings amount to a deposit account or credit union on the day you get paid. This is beneficial from a psychological point of view as you are paying yourself before all the expenses and bills arise each month. When you receive a rise in salary make sure you increase your savings as well. Try to increase your pension contributions over time, and negotiate with your employer to get them to pay more into your pension. Marginal changes make a big difference. Ask yourself can you get a better deal elsewhere on household utilities (Gas, electricity, internet, tv). Can you improve on your most significant expense such as your mortgage? Many properties have increased value over the last few years, and it could be very worthwhile to review to see if you can get a lower interest rate, which will save you money in the long run. Are you paying too much for your House Insurance, Car insurance, and Life Insurance.? Review all major outgoings to see if savings can be made. This article represents the views of Eoin Wilson and does not represent the views of Pure Finance Ltd. Eoin Wilson is a Financial Adviser and founder of Pure Finance Ltd. This article does not constitute Financial advice. I would always recommend getting Financial advice if you have any queries in the following areas: Pensions, Savings or Investments. Talk to a broker you trust and is transparent with their fees and charges. Pure Finance Ltd is regulated by the Central Bank of Ireland.